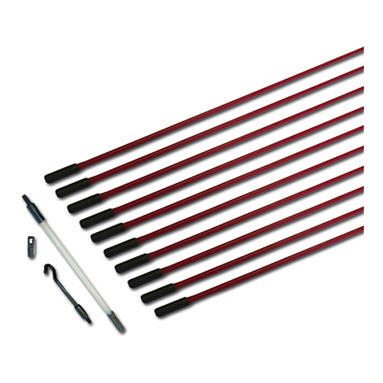 Armeg Cable Rods - Cable Guide Mini Set (10 x 330mm Rods) is the quick and easy cable-routing solution! Specifically designed to save time when routing cables through holes, cavities and conduits. New and improved design that helps to provide electricians with ultimate tensile strength (100 KG) and maximum user comfort. Slim fit design helps the user to route cables through cavities as small as 8mm! 10 x 330mm fibreglass Armeg cable access rods with high grade connectors. Supplied in handy carry tube.